ABF (Awesome Boyfriend) & I stopped by a favorite spot of ours recently--Cabana. 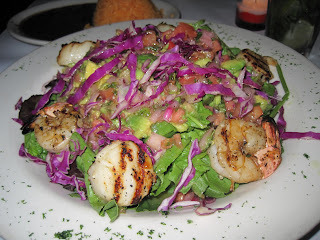 Cabana is one of the first restaurants I tried when I moved to NYC, and it remains a favorite. ABF and I hadn't been since New Year's Eve (which was our first trip there together), so I guess you could say we were overdue! 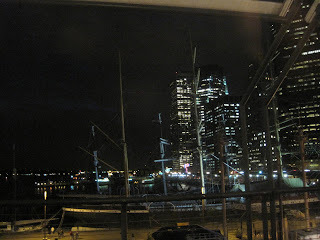 It was a Thursday night, and I met ABF after work not far from the Seaport. It wasn't quite warm, but it wasn't cold, and yet the outdoor seating offered there was perhaps a little too risky. 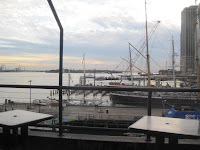 We got a table right by the window, which offered gorgeous views of the East River, downtown NYC, the ships docked at the Seaport, etc..provided you were tall. My actual view if I turned my head to the right was foggy and clouded, but if I sat up a little in my seat (at least for snapping photos), it was quite lovely. We ordered a sampler appetizer, and I was excited because it came with one of my favorite items at Cabana: shrimp fritters. 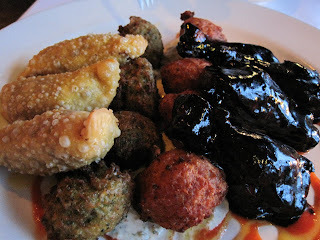 These babies are TASTY (they're the orange balls under the jet-black chicken wings). It also came with vegetable fritters (meh, these didn't do much for me), beef empanadas (always a good bet), and jerk chicken, which to me looked like it was dredged from the wreckage of a terrible oil spill. Have you seen those commercials where they're rinsing off the ducks, otters, etc. from oil spills? 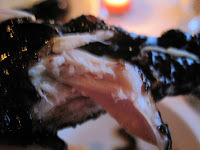 (love that duckling's plucky little quack at the end, btw) That's what these wings looked like! My friend Patty summed it up nicely by saying "Oh, Chicken Valdese!" Patty for the win, folks! Despite the unnerving appearance of the wings, they were actually quite delicious (and not at all greasy). They were messy as heck tho--it's tough to hide a big blotch of black sauce on one's pasty face, I quickly discovered. These wings are totally worth the mess though, hot, spicy but not incapacitating, and scrumptious. I could NOT get enough of this sauce. I may even have licked a finger or two (sorry, Mom). These wings are a close second to the awesome shrimp fritters. We each got a mojito, which is almost a requirement there. 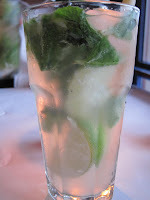 I normally get the regular, plain mojito (mint, rum, mint and more mint, what's not to love? 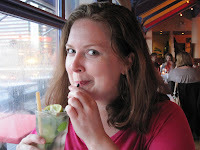 ), but this time I opted for the mojito with the Cruzan rum. It was good, but not great, which means I'm going back to the standard. I rarely like to mess with the original mojito. ABF's mojito (credit: lighting direction by ABF in both mojito shots) was one we'd tried on our last visit on NYE: it was made with 12-year old Montecristo rum. We both scoffed last time that it would make much difference, but one sip changed our minds. This time, however, it wasn't as noticeably better than the regular one--maybe the Thursday night bartender was second string? It wasn't bad, it just wasn't as remarkable as the one we had on our last visit. 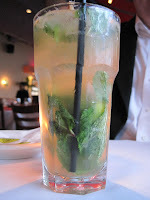 I DO feel we need to procure some Montecristo rum for our own mojito-making! 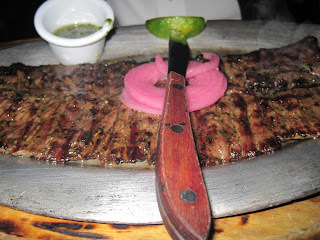 ABF got the skirt steak with chimichurri sauce (I think my eyes lit up at 'chimichurri.' I LOVE THAT STUFF! 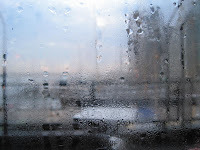 ), and I think he agrees that we have to make our own very very soon. It's delicious and good on everything from eggs to steak to chicken to ... you get my point. Do you know how good parsley is for you?? ABF's dish was so tender and delicious--a definite win. The pickled onions on top were a nice, acidic balance to the salty goodness of the steak. This was a good dish, man. But wait..there's more: dessert! 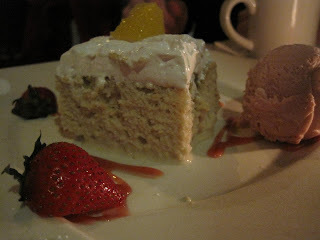 We got the tres leches cake, which came with strawberry ice cream. The cake was super moist and dense without being heavy. We both really enjoyed this. 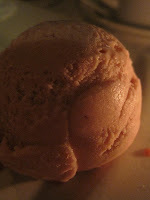 It also inspired me to try out an Alton Brown recipe in the near future! Chimichurri and tres leches: both on my 'to-make' list! Once again, an amazing meal at Cabana, with a lovely view to bid us good-night on our way home. That salad made me salivate!! Oh, Hoosh, definitely let me know how that recipe works for you! I don't think you can ever go wrong using CI! !